Happy New Year to you all - we hope you’ve all made your New Year’s resolutions to spend more time gardening and growing your own this year? It’s almost the end of the month and we have all made it through January! I must admit I love January in the kitchen garden, although it may seem the bleakest month of the year for some, for me it means getting back outside again in the fresh air after spending far too much time indoors over the Christmas holidays and the anticipation of the spring months to come. Although we have had a few frosts it has still been a fairly mild (but frequently gusty) start to the New Year - we have seen no sign of snow (as yet!) but things are starting to creep back into life again. 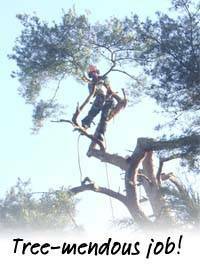 It has been quite an energetic month in the garden we have had the tree surgeons in topping and thinning out trees to give us more light in the kitchen garden, we are hoping it has made a big difference but only time will tell – not long before those trees start bursting back into leaf again. We have got some new gates adorning the kitchen garden too, lovely solid oak gates that will hopefully stop the dogs walking over our beds and stealing apples in the summer. The apple espaliers have been pruned and new posts set in for the fruit trees that were planted back in 2005 and have now outgrown their space. 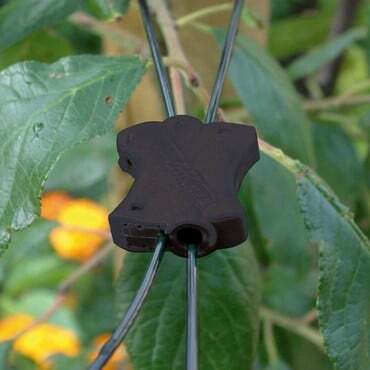 We’ve used the Gripple supports once again – these are an excellent choice for supporting espaliers or any berry fruit such as raspberries or blackcurrants. 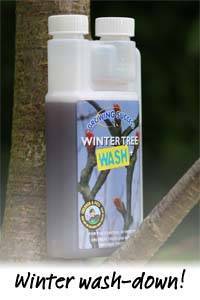 Our fruit trees have also been sprayed with an organic Winter Tree Wash to get rid of any loitering pests, we were a little bit late with this (ideally should have been done Nov/Dec) but better late than never eh! The days are noticeably longer already but I did make the most of a dreary dark afternoon and sorted all my seeds out into this Seed Organiser – I felt like I’d achieved something amazing that day! Little things please little minds or is it Little things please tidy minds! The sweet peas have been pinched out (in order to make them bushier) and have been moved into the cold frame along with the ‘Super Aquadulce’ broad beans to make way for the seeds. Our second sowing of Sweet Peas (this time ‘King Size Navy Blue’) are in the Vitopod we fancied a different colour contrast to the pink & lilac ‘Organic Spencer’ variety we are already growing. For those of you into Latin names this is Lathyrus odoratus to you! The propagation heat mats and grow lights have been set up on the greenhouse staging and my first seeds of the new year have been sown this week. We have got early varieties of lettuce ‘Valdor’, along with Rocket, ‘Gardener’s Delight’ Tomatoes and some herbs under way. 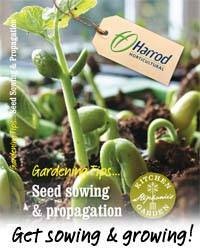 We have a Sowing & Propagation Tips DVD - presented by our very own Daily Express-published horticulturist Martin Fiddes - available if you need to brush up on your propagation skills. 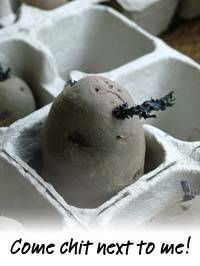 We were excited when our seed potatoes arrived as we wanted to get them ‘chitting’ as soon as possible as we plan to plant the earlies up in mid February in Potato Planters in the greenhouse for a much earlier crop. Early varieties we have chosen this year are ‘Casablanca’ , ‘Colleen’, ‘Maris Bard’ and ‘Orla’- all are organic varieties and hopefully will give us a good tasty yield. These are all chitting away in the cool but bright shed before being planted out in a few weeks time. We’ve already got some rhubarb being forced – we’ve chose a Victoria variety to force this year and instead of our usual terracotta rhubarb forcers we are trying out a more economical heavy duty polyethylene forcer to compare the results. Did you know that Rhubarb is officially a vegetable by the way! Our Kitchen Gardener Lynn has been planning ahead this month and has dug a bean trench filling it with kitchen vegetable peelings – this will give our varied selection of climbing beans a head start to grow into when they go in the ground. A coat of Eco-Wood Treatment has been painted on some of our older raised beds just to give them a spruce up for Spring! Lots of exciting new products have arrived over at the kitchen garden for us to put into action – I will be taking photographs of them over the coming months to show you them in use in the garden. • Manuring the soil and warming up the beds with polythene /fleece in readiness for planting out some crops under cloches. • We are installing our new range of Roman arches at the kitchen garden, so we have to carefully unravel the existing pear trees from their existing arches and give them a new framework to climb up. • Sowing some early peas varieties in guttering. • Our shallots have arrived so we will be planting those out mid February – we have gone for Longor & Red Sun varieties this year hoping for an early crop. • Serious seed sowing will get underway, many varieties of tomatoes to be sown undercover, also leeks, peppers, aubergines, chillies, Sprouting Broccoli & cabbages. • Outside we will be sowing calabrese, summer cabbage, ‘Amsterdam Forcing’ carrots, spinach, beetroot, shallots and new Asparagus plants! And if one of your new year's resolutions is to spend more time in the garden growing your own, you can pick up loads of handy tips by using the expertise we've got to hand. 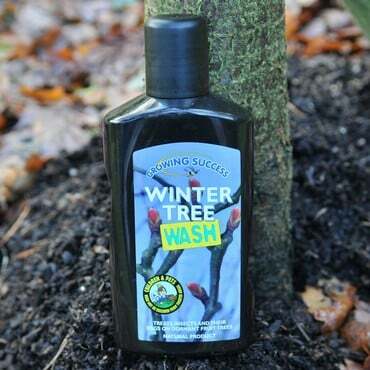 We're always here to offer advice and support - just e-mail kitchen gardener Lynn, pest control expert Julian Ives and horticulturist, Master Composter and Tweeter Martin Fiddes (also known as our Ask the Expert panel) and they'll do their best to help! With spring not exactly knocking on the door but certainly walking purposefully through the front garden and daylight/gardening hours growing ever longer, why not take the opportunity to fire up the PC/laptop and join the social media revolution before your seed sowing takes off! Sounds complicated? Well, it's not as all you need to do is click on either the Twitter or Facebook icons below to visit our bustling Twitter feed and Facebook pages. Twitter or Facebook to get in touch with us as well. With our webteam manning the Tweet decks and Facebook site, you can be sure you'll get the best service we can offer! And finally, some reading material to while away those long winter evenings! Our 116-page 2012 catalogue is out now and it's packed full of gardening ideas, products and solutions to the problems every gardener faces. There's even a flip-over 19 page Garden Structure section for all your arches, obelisks, plant supports and much more - if you haven't already, request a copy and find it on your doormat in a couple of days time.